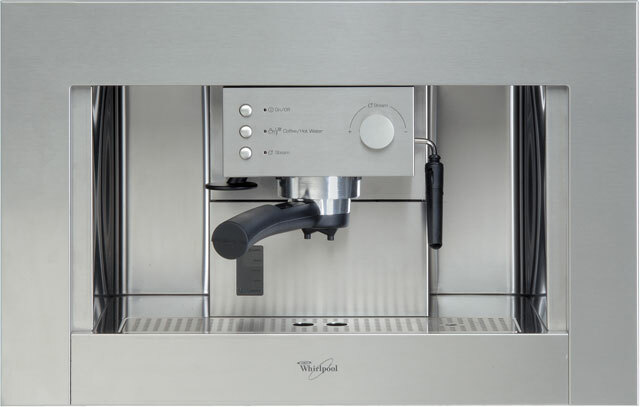 Prepare delicious, aromatic coffee at home with this built-in bean to cup machine from Whirlpool. Compatible with ground coffee, you’ll be able to prepare all your favourite blends with ease. The intelligent steam arm creates a professional milk foam for silky-smooth lattes and creamy cappuccinos – really handy when you have guests over with varied tastes. It can prepare two cups of coffee at once, making it perfect for entertaining, and it has an easy-to-fill 2 litre water tank so you can keep the coffee flowing late into the evening. If you love café-quality coffee, a bean to cup machine is a brilliant choice. With a built-in grinder, it’ll create the grounds just before making your drink, so it’ll be totally fresh and full of flavour. You can even play with the settings to get the best blend every time, while the built-in milk system will help you effortlessly create smooth cappuccinos and lattes. So, you can always prepare a fresh, flavoursome drink to perfectly suit your tastes. Looks good, nice finish, surprisingly easy to fit, easy to use. Makes a great coffee with a smooth top, can only vouch for espressos so far. A tad noisy would be the only complaint, but it's fairly quick. * ACE010IX_SS was at the higher price between 07/03/2019 and 08/04/2019.